...but it's probably true that most fans simply could not believe their eyes and ears when confronted with their first episode... and stayed to become utterly hooked. In other words, Cult TV. The actors who've appeared in it get everywhere - in Australian soaps and films especially. Also, there is a high "reappearance" rate for the actors in very minor roles, and spotting them is all part of the fun. It's complete - unlike other soap series, Prisoner actually finished in a satisfying way and can be appreciated as a whole. It's being shown again. When Channel 5 started in the UK at the end of March 1997, Prisoner was scheduled to be shown every day, but at a ridiculous hour of the early morning only accessible to video owners, shift workers and insomniacs. Within a month, Channel 5 dropped the early Monday morning episode. From the end of June 1997, it was moved to a more reasonable hour, and shown on weekdays only at the rate of five episodes a week. Between September 1st and December 30th 1997, this was cut back further to 3 episodes a week - Monday to Wednesday only. 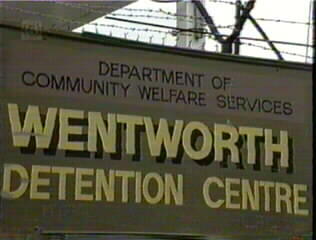 Between January 1998 and March 28th 1999, Prisoner moved back to the early morning timeslot with five episodes a week - Tuesday, Wednesday, Friday, Saturday and Sunday. From April 1999, the weekday morning episodes were cut to make way for extended sports coverage - Prisoner was shown twice a week on Saturday and Sunday mornings. The last two episodes were shown together on Sunday 11th February 2001. So this is a complete and accurate guide to the whole series? Erm... no, not quite. Although there is now a full set of episode summaries, some of them are very brief and they will be extended as Channel 5 broadcasts them. I still have quite a few missing or incomplete credit sequences, though. However, I'm pretty sure that most characters are in here somewhere, and I've added some others using information in other sources. There are about 2,300 character credits here, and about 1,300 actors' names. And I'm still finding mistakes. If you spot any, I'd be grateful if you let me know. Thanks again to those who've already helped. There are basically two sets of pages: one for the actors and one for the characters. The actor pages are in alphabetical order by surname. If you want to check up on a particular actor by name, use the contents list to find the page you need. The character pages are the same, but they are in order by first name rather than surname. I have adopted this system because many characters are only ever credited by their first name. Even though their surname may appear frequently in dialogue, it is not possible to establish a definitive spelling. I think it's usually easier to remember first names anyway. However, if the character is credited without a first name (e.g. Mr Gibson), then surname is used instead. Generic descriptions like "Passerby" or job titles like "Magistrate" are filed exactly as they are in the credits. There are links from every character name to the actor's name and vice versa so you can swap backwards and forwards between the two lists to see instantly what other roles an actor played or find an explanation of who a character was. You may have to wait a few seconds for the whole page to load before the exact place is found. There are also episode summaries for the whole series. These contain a transcription of the credits for each episode, with links to the actor and character pages for new characters and actors playing more than one role. I've not seen all of Prisoner - you're not going to give the plot away, are you? If you haven't seen the whole run of Prisoner, I can't guarantee that you won't accidentally stumble across something that will ruin the surprise of any particular plotline. I can only recommend that you find out which episode number you are seeing currently in your region - the episode numbers provided throughout will help if you wish to ignore anything later than the episodes you have already seen. Longer entries for the major characters are in a separate place that you have to choose to see. If you don't know the ultimate ending of the series, I strongly advise you to keep it that way - DON'T look at the longer entries for Joan Ferguson, Ann Reynolds or Rita Connors. Will you keep it up to date?